The cost is $55 per rider. 9 years old and older. Join us for our most popular evening ride filled with spectacular panoramic views of the Valley of the Sun to T-Bone Steakhouse, South Phoenix’s most authentic Western restaurant. T-Bone Steakhouse is a popular oasis with great food and a reputation for the “Best Beef in the West”, attracting cowboys and ranchers since the 1940’s. 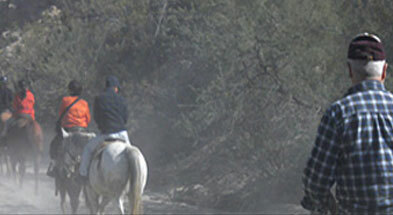 Our T-Bone ride departs Ponderosa Stables in time to take in the breathtaking sight of the Sonoran Desert at sunset. The hour long ride down the mountain will whet your appetite for a delicious dinner cooked over a mesquite grill accompanied by a vast selection of wines, microbrews, domestic beers, and soft drinks. Of course, there’s always dessert! The return ride brings you back through the mountains after dark where you’ll be dazzled by the beautiful view of the valley lights and the desert at night. This ride is sure to make any occasion special! You’ll definitely make an impression with an outing to the T-Bone. Plan a truly romantic date, reward your co-workers, treat corporate visitors to this unforgettable change in venue, or surprise your out-of-town guests with a unique dinner experience. This ride is great for riders of all experience levels and the restaurant is only a short drive from the stables if some of your guests may not wish or may be unable to ride a horse, but still would like to join you for dinner. Reservations required. Please book in advance. Non-refundable 50% deposit for groups of 10 or more. Departure times will vary with sunset time. 602-276-0945602-276-0945 or visit them on the web at www.t-bonesteakhouse.com.